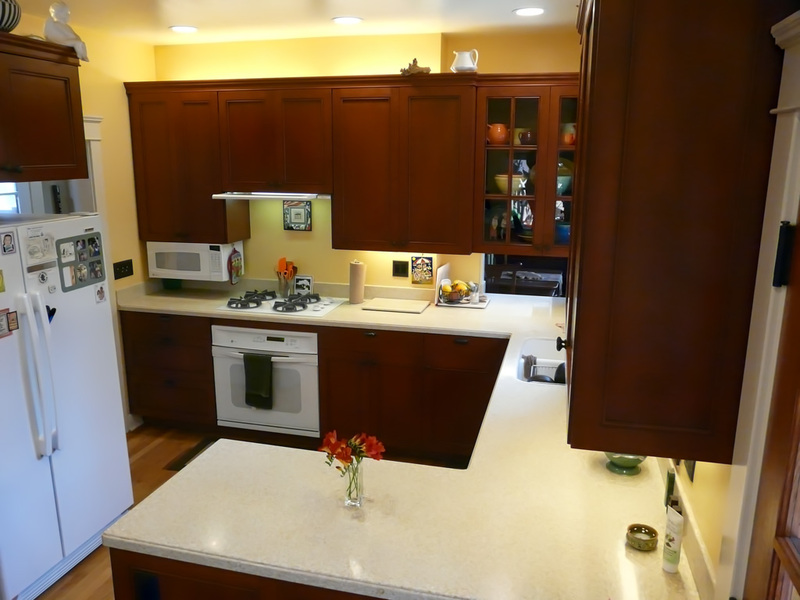 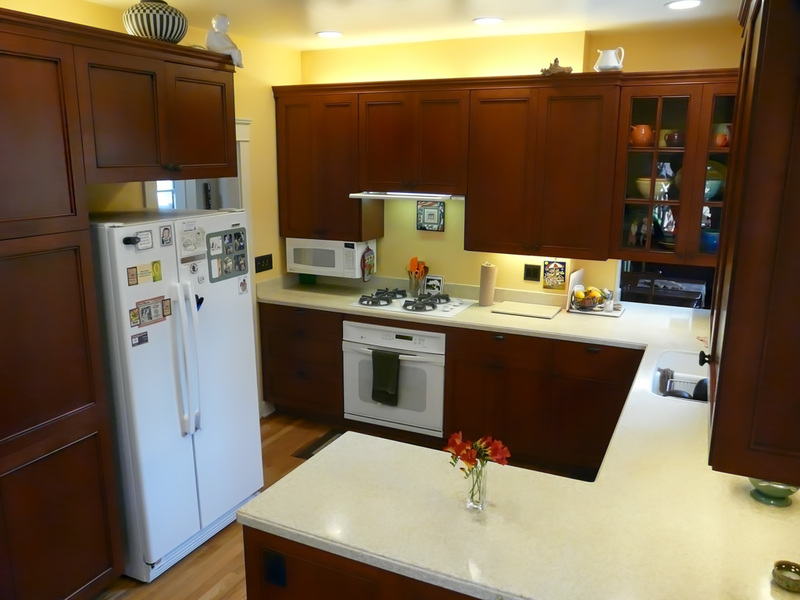 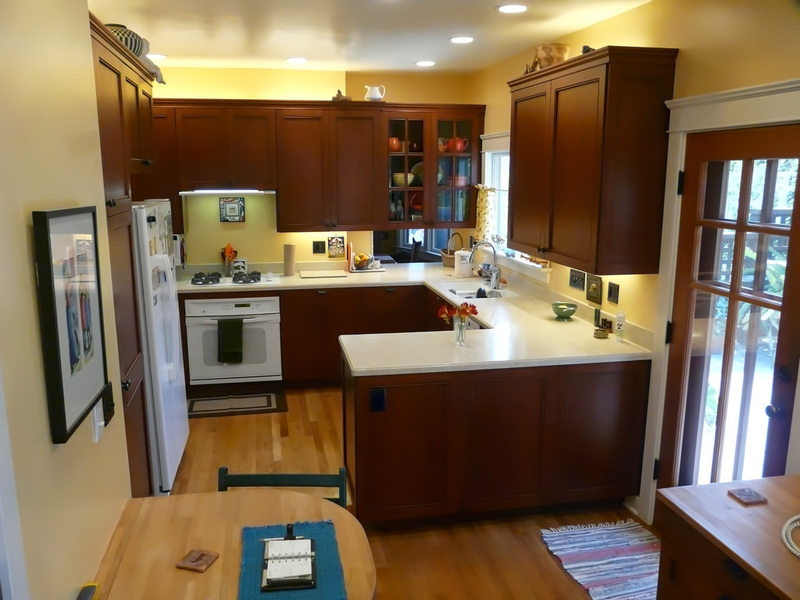 Great care was taken during this project to make sure the new kitchen, office, and adjoining room cabinetry fit in with this South Park Mission Style home. 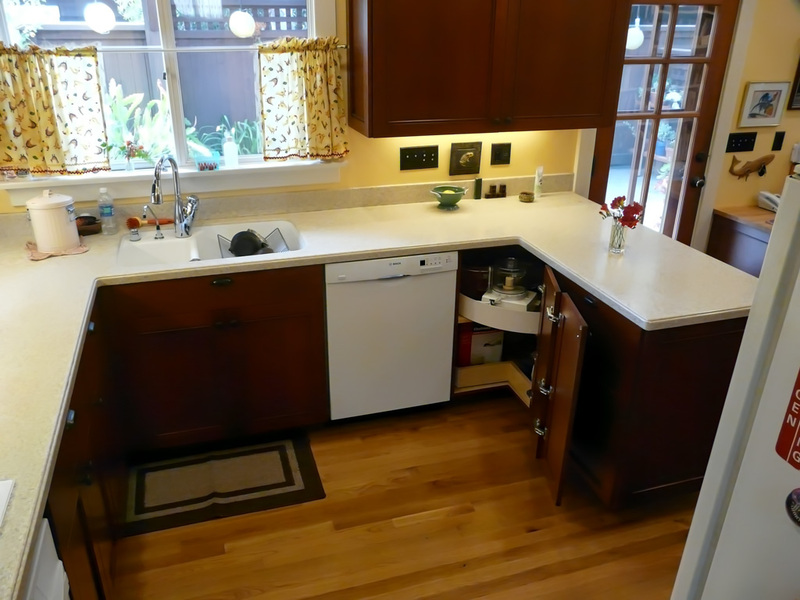 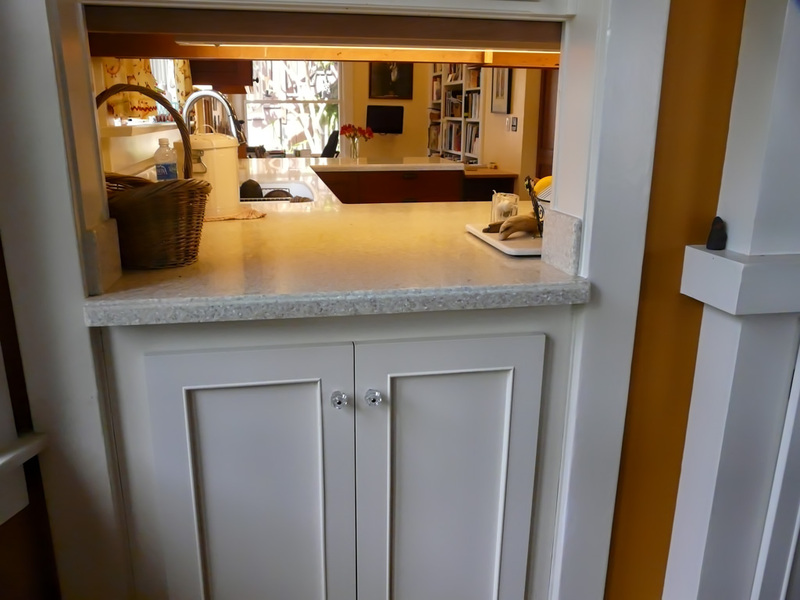 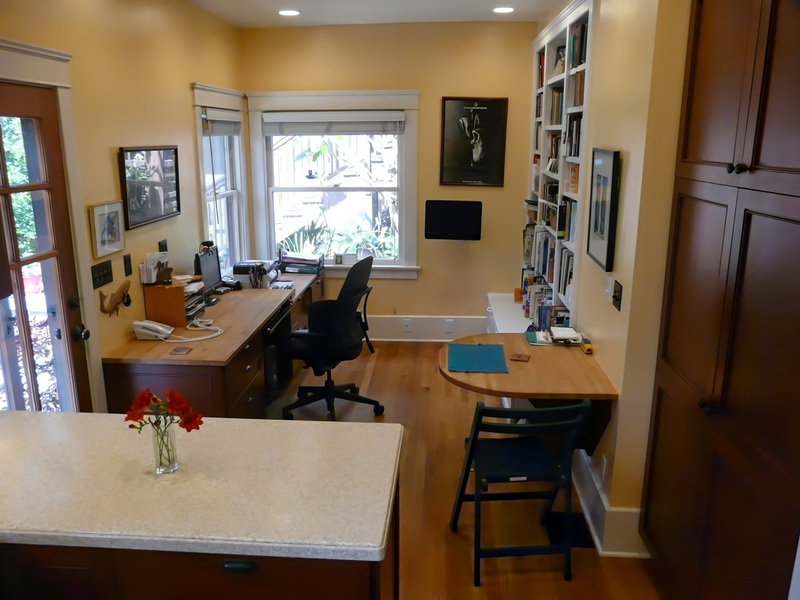 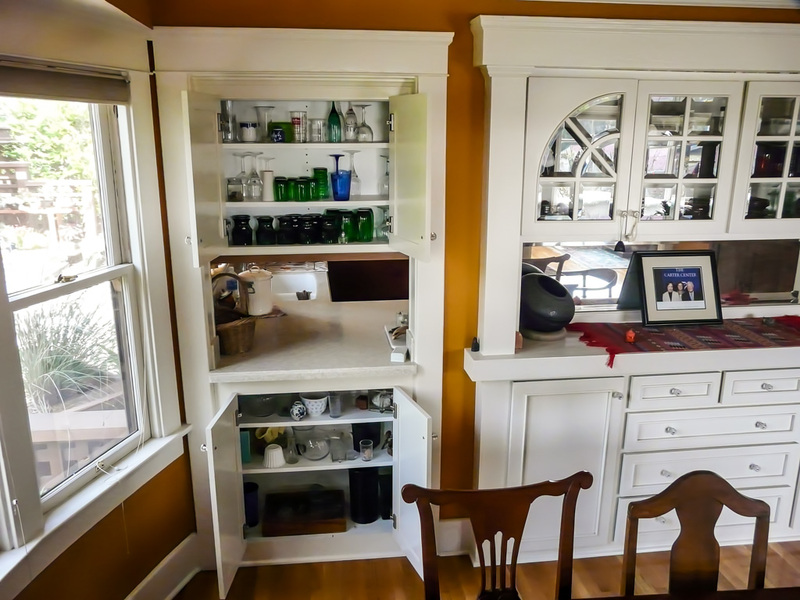 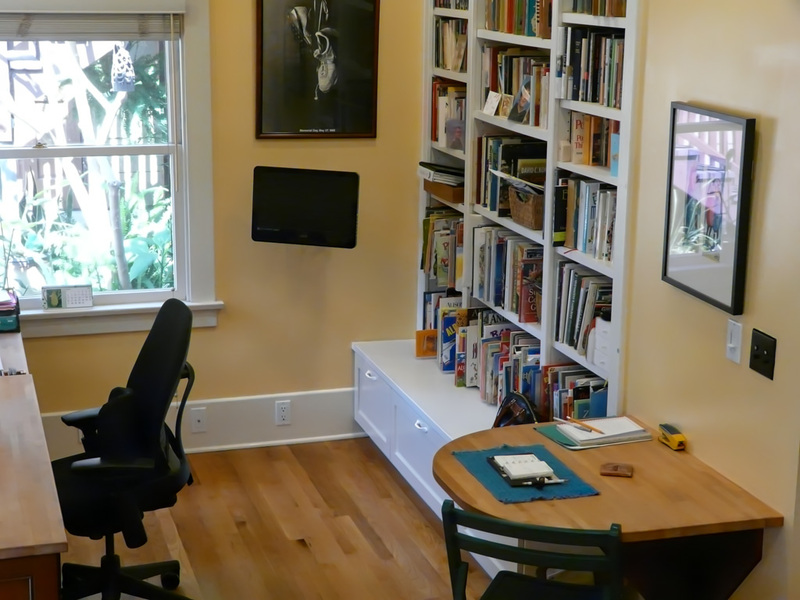 The kitchen was rearranged to create more usable counter space and storage while tying into the existing cabinets in the dining room that pass thru into the kitchen and an existing bookcase in an area re-purposed as an office, with a small drop down table that doubles as a breakfast area. 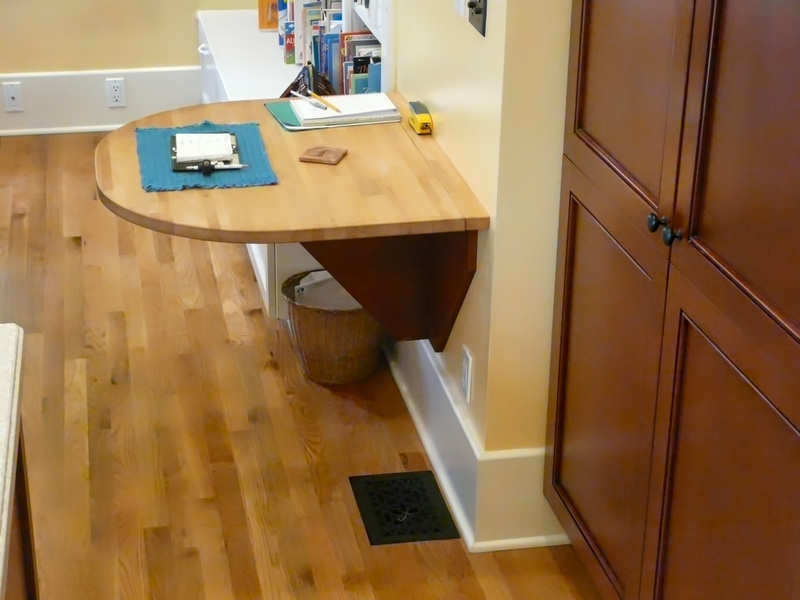 This table has been used by me many times and was originally published in “Better Homes and Gardens” in the late 1980s. 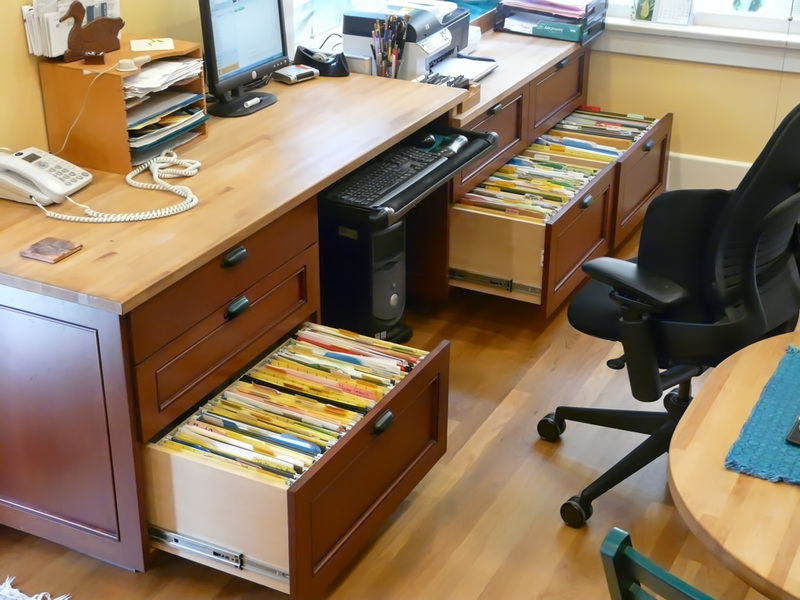 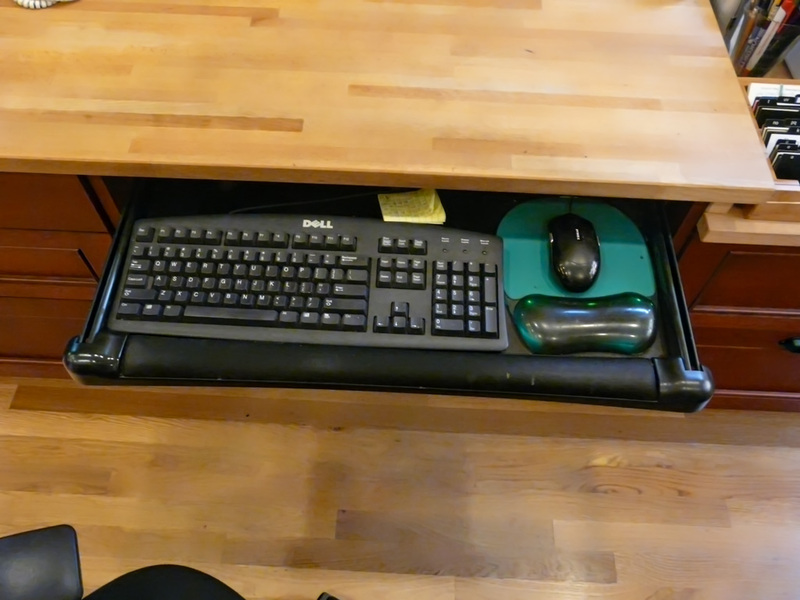 We reused the bookcase in the office area and added file drawers at the bottom. 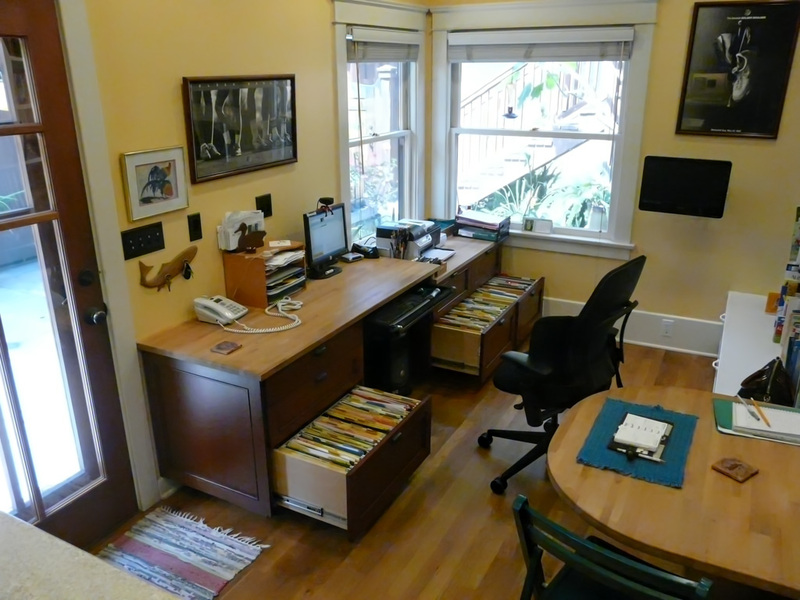 The new desk area is two levels to avoid the need to replace the low existing windows, and has plenty of file drawers and the built-in computer desk center. 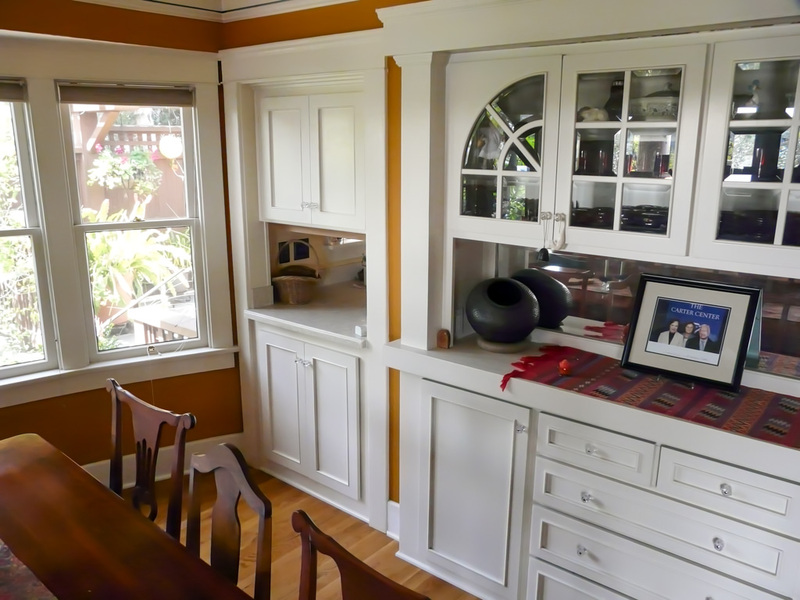 One tricky part of the project was reusing the faces of the cabinets in the dining room to not disturb those built in mission style cabinets, while keeping the pass through to the kitchen. 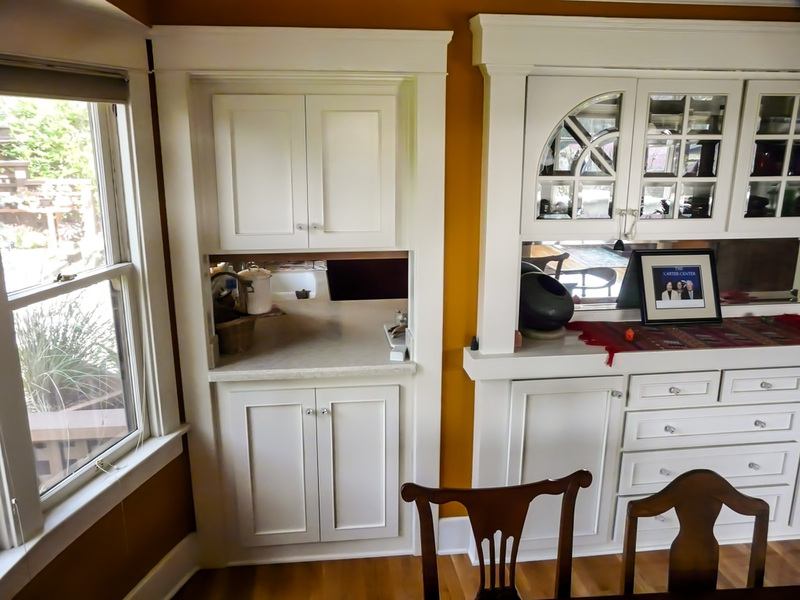 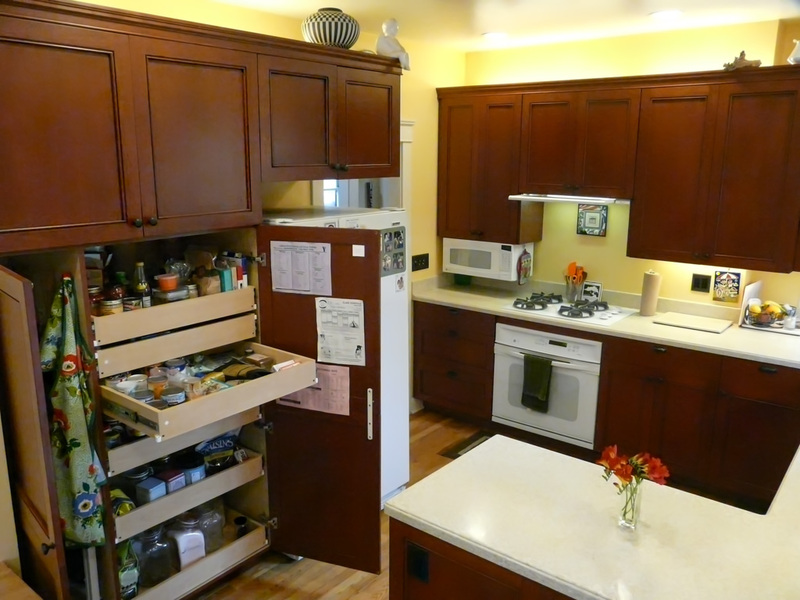 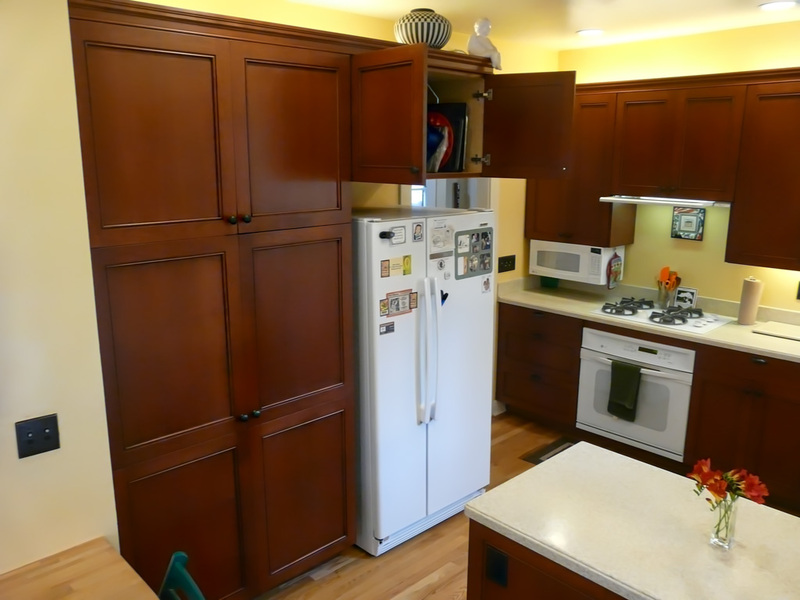 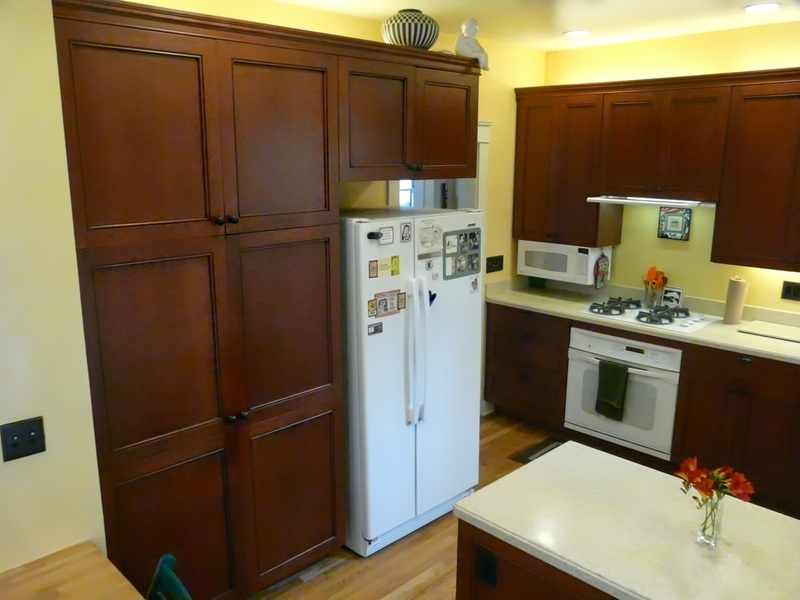 We carefully removed the old kitchen cabinets and the insides of both the dining room base and wall cabinet you see in the photos without removing the face and doors. 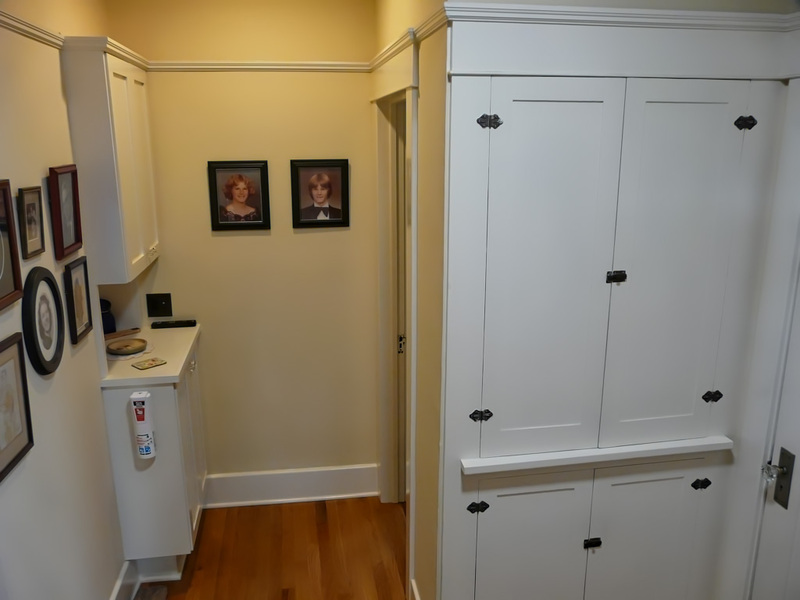 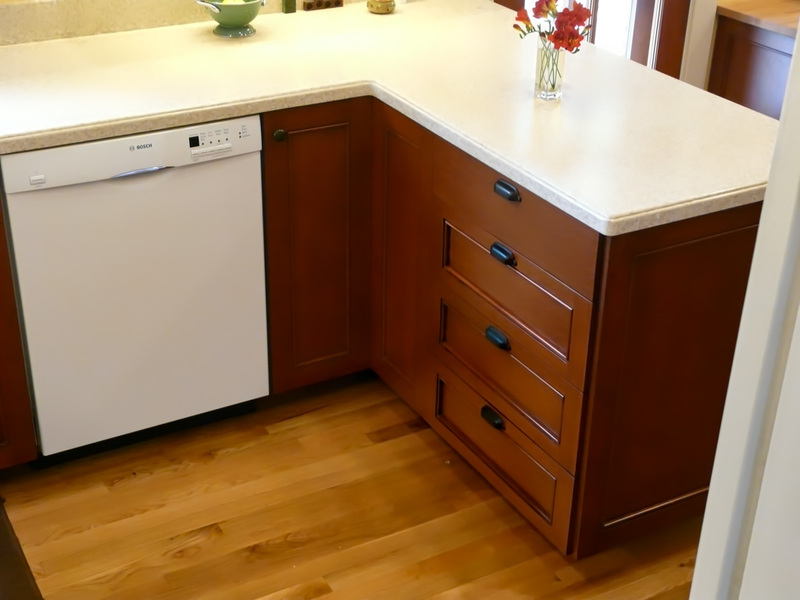 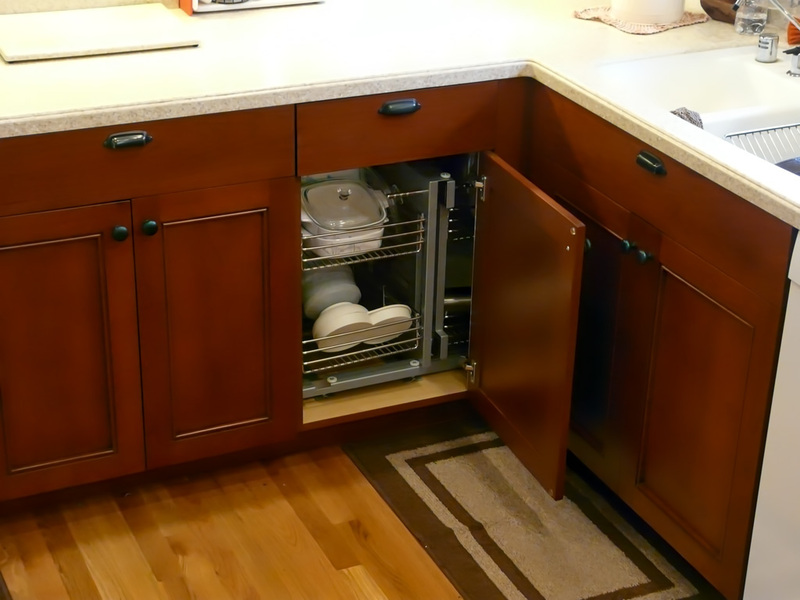 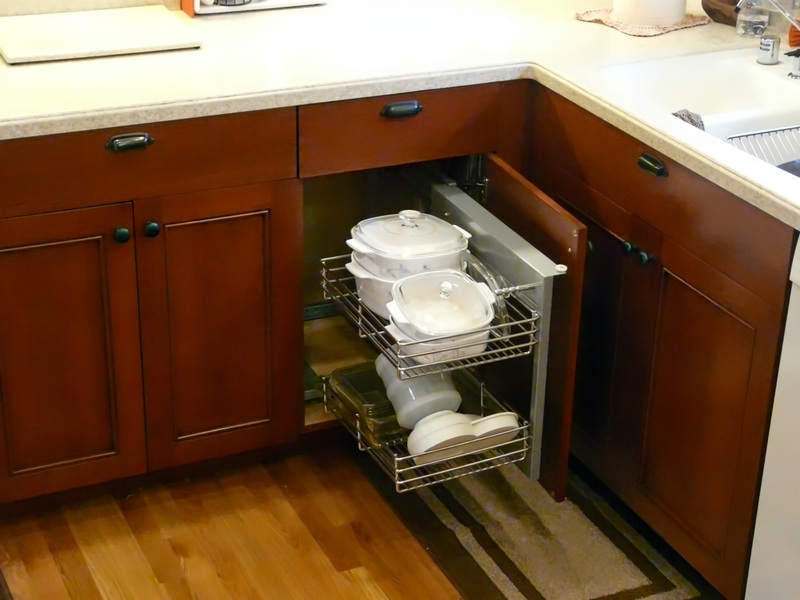 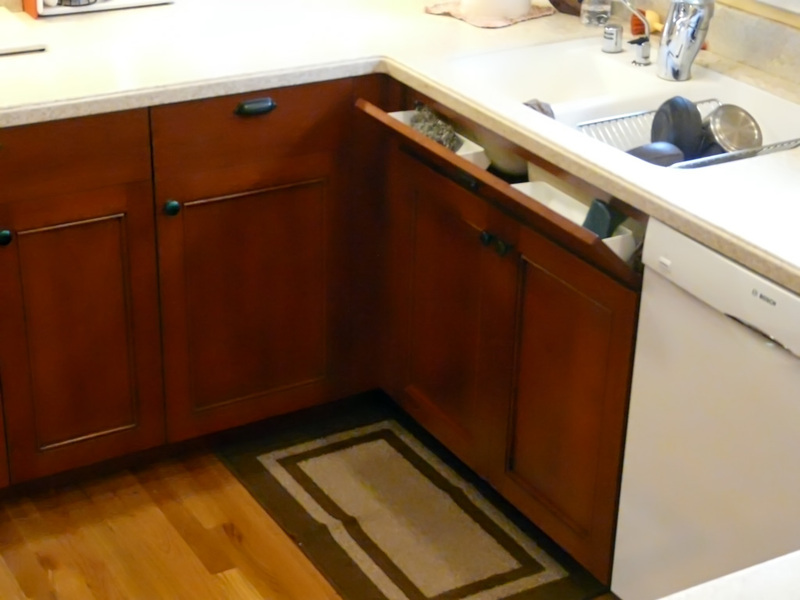 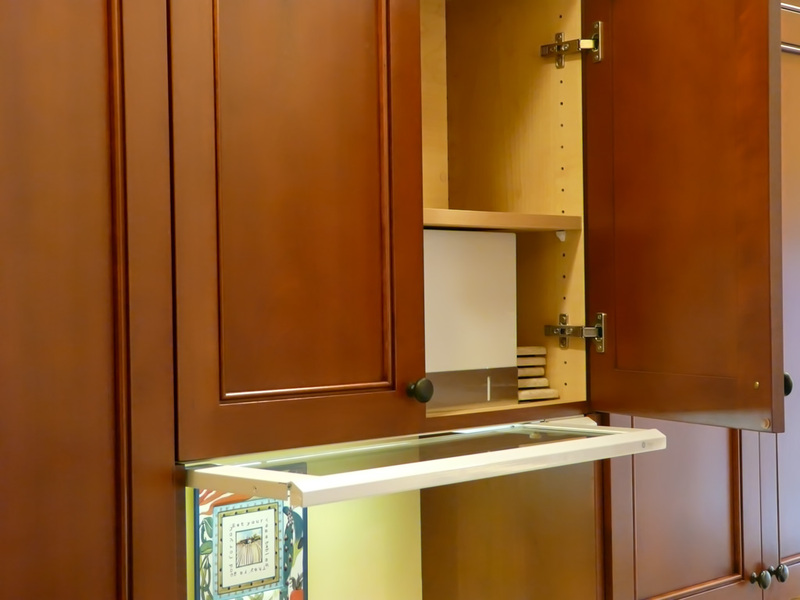 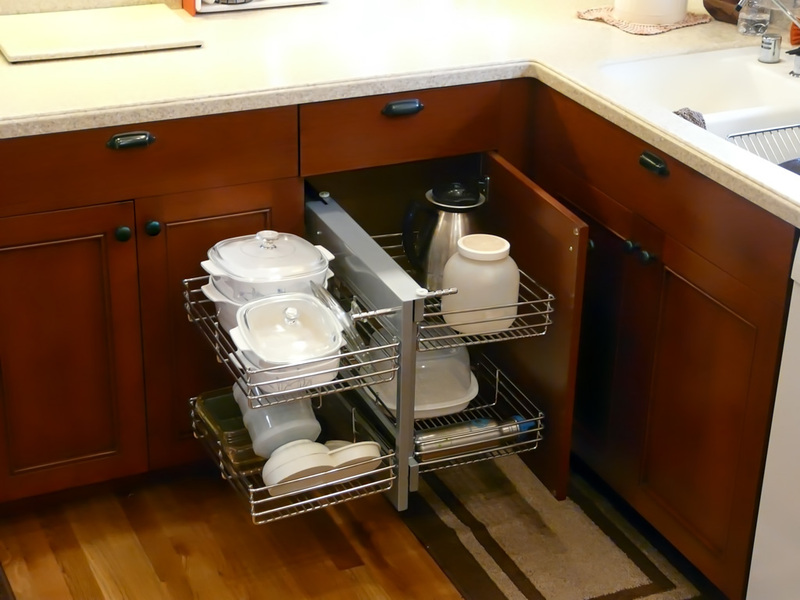 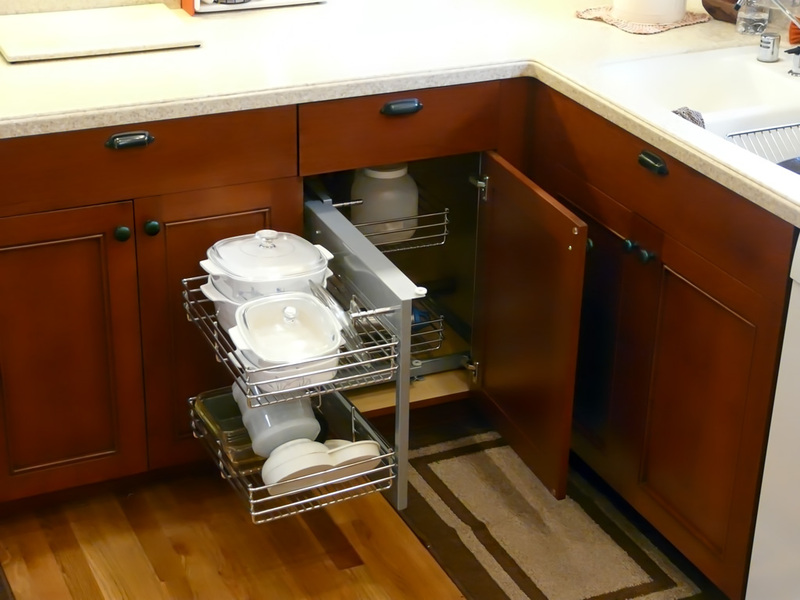 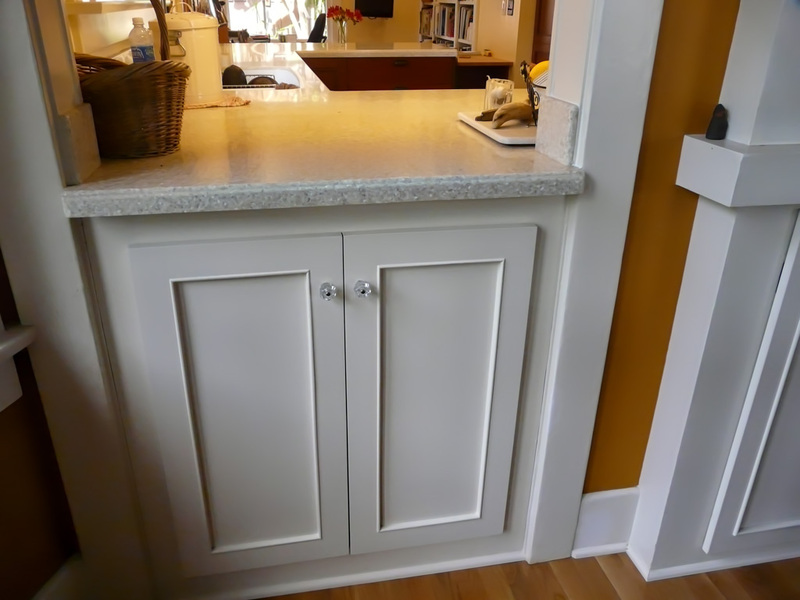 We they created new cabinets for the kitchen and new interiors for those dining room facing cabinets, that integrated into our kitchen storage plans while also giving access from the dining room. 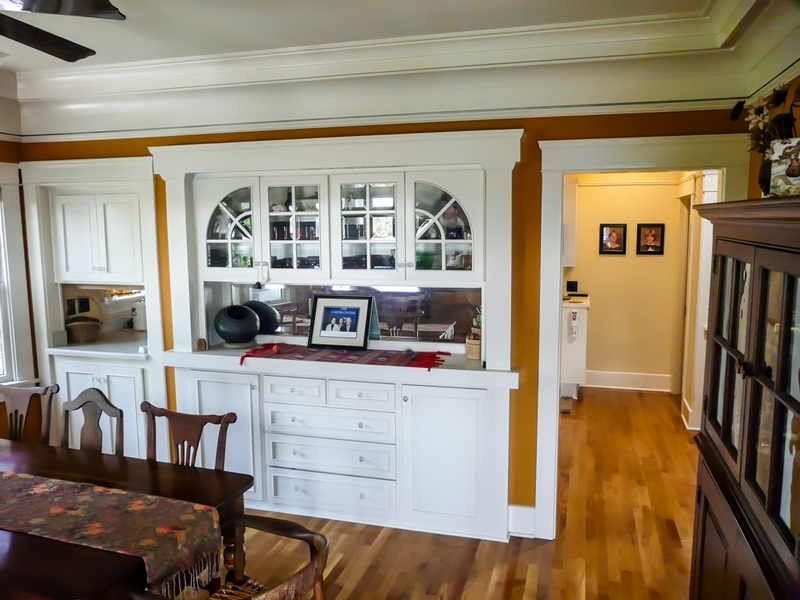 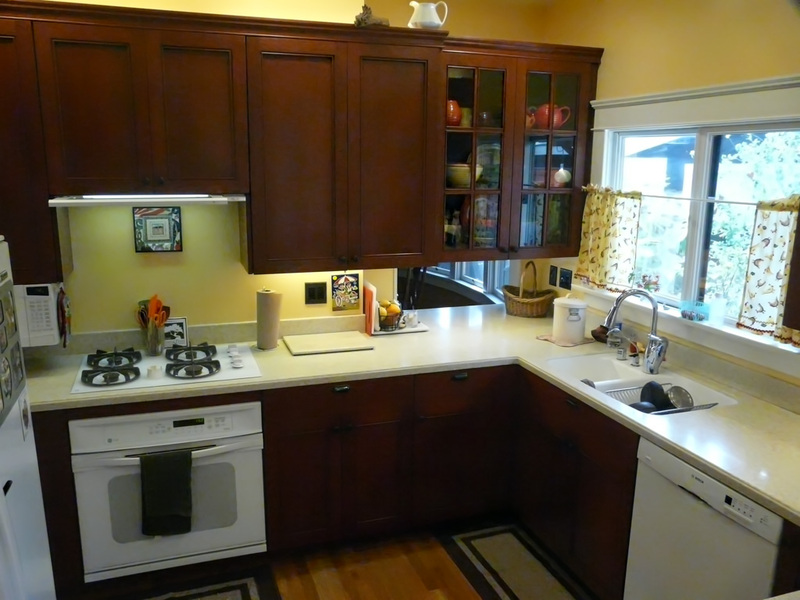 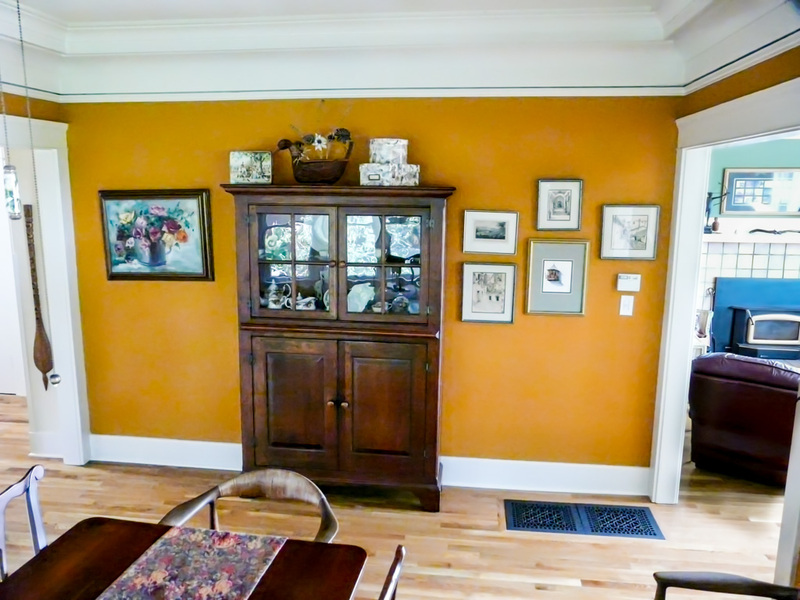 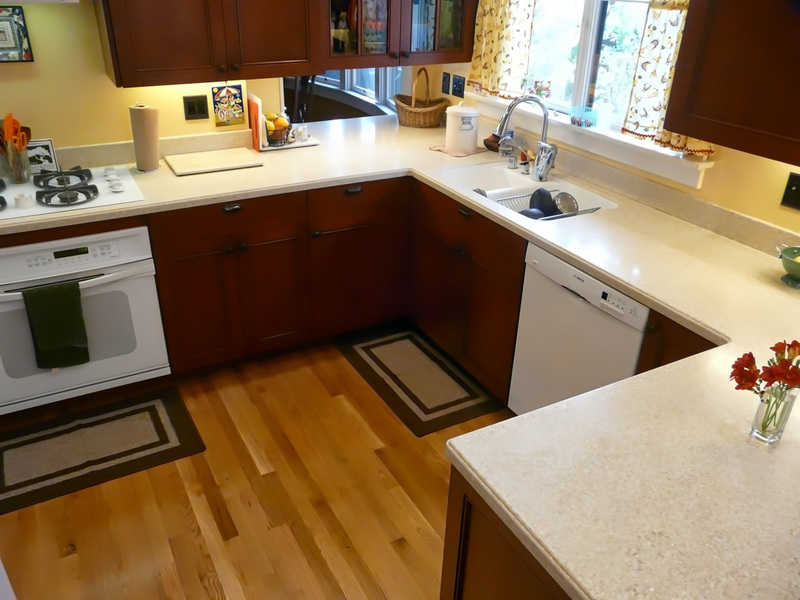 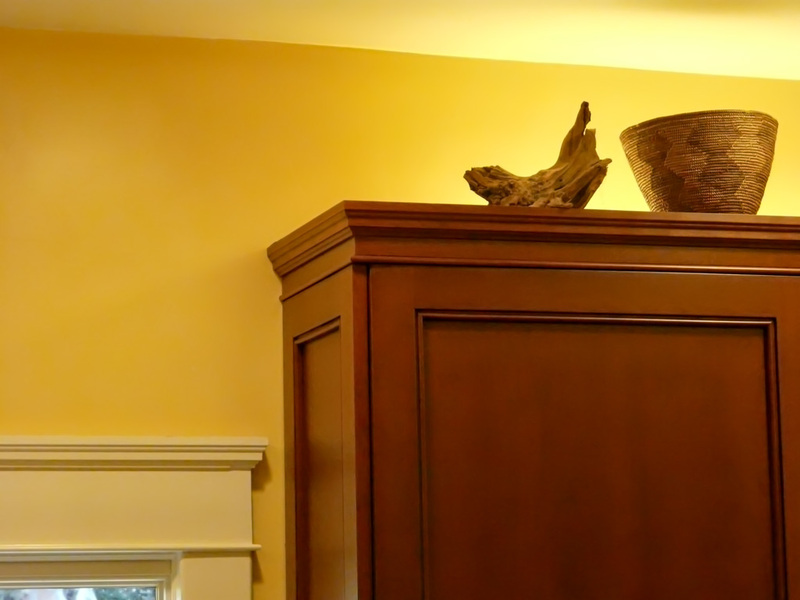 The home’s existing hardwood flooring was matched and extended into the kitchen, and the new kitchen cabinets were crafted to pick up the colors and materials in some of the homeowners existing antique furniture. 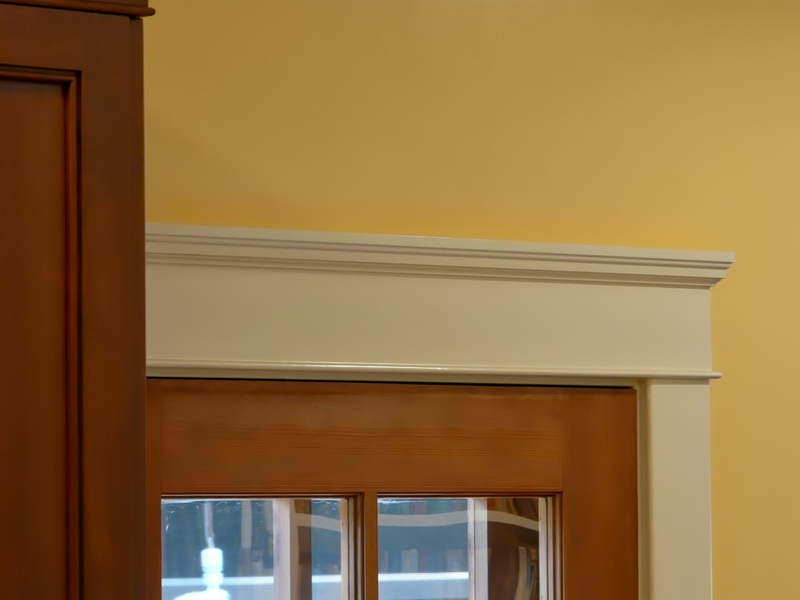 We used a dark burgundy color on solid Cherry wood in a classic door style with Mission style trim details used on all the old doors and windows to pull this project together and tie the new to old consistently and tastefully. 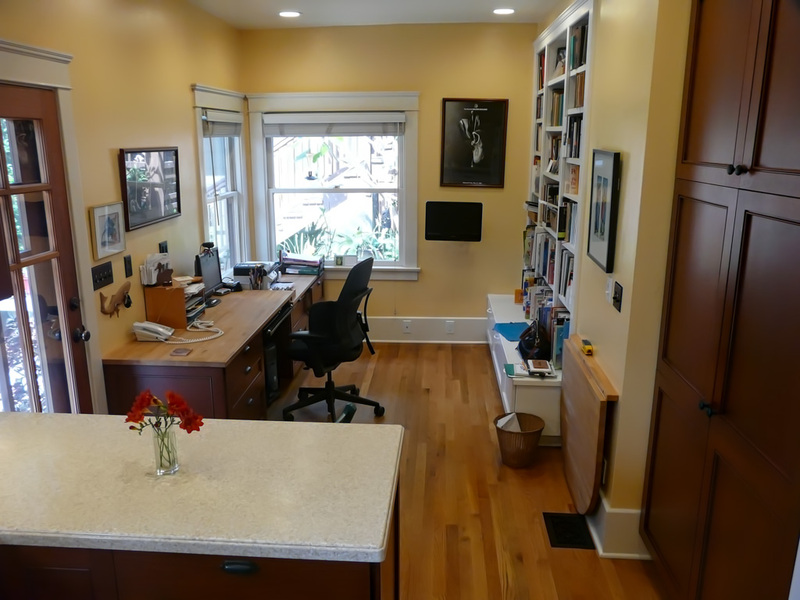 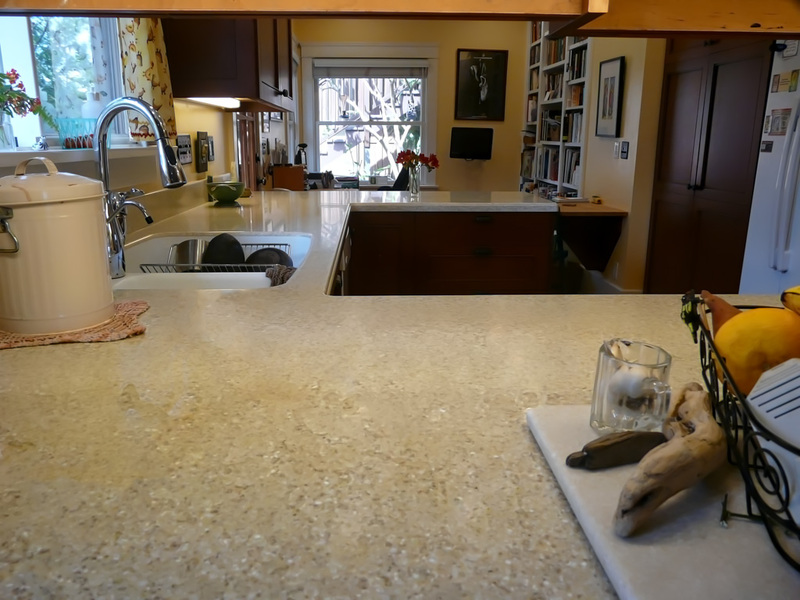 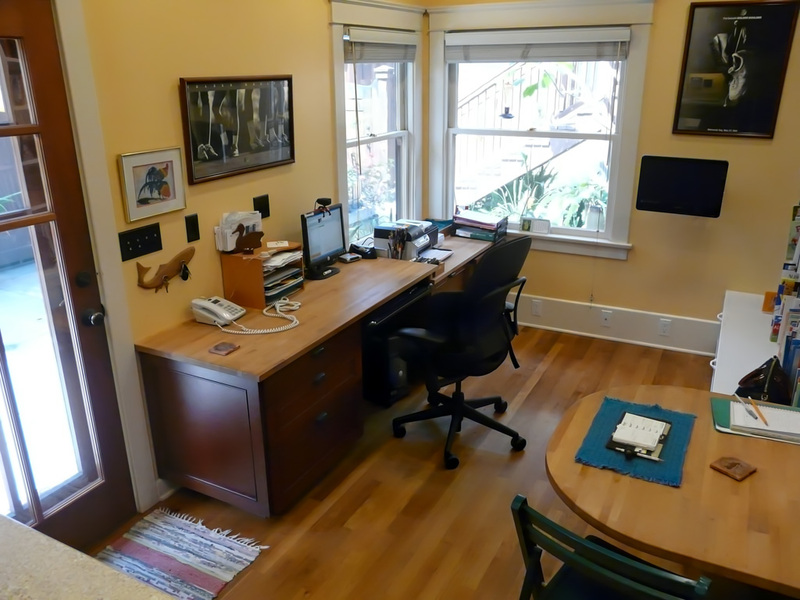 This project follows our primary remodeling objective: “to make every remodel, look and feel like a well designed original part of the home” and not an obvious remodel. 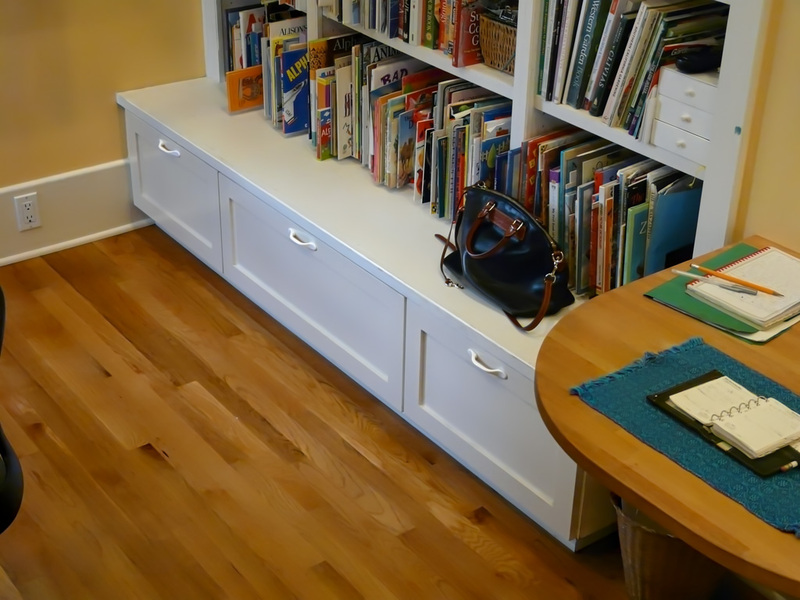 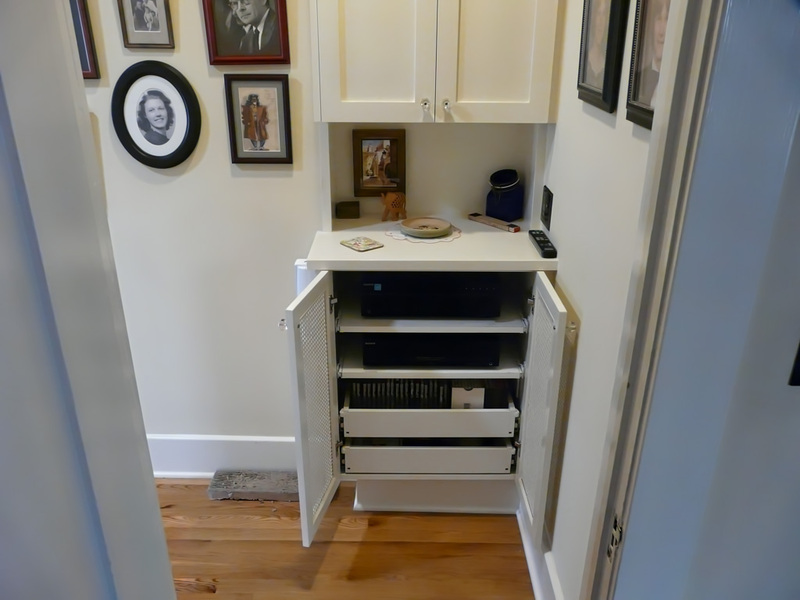 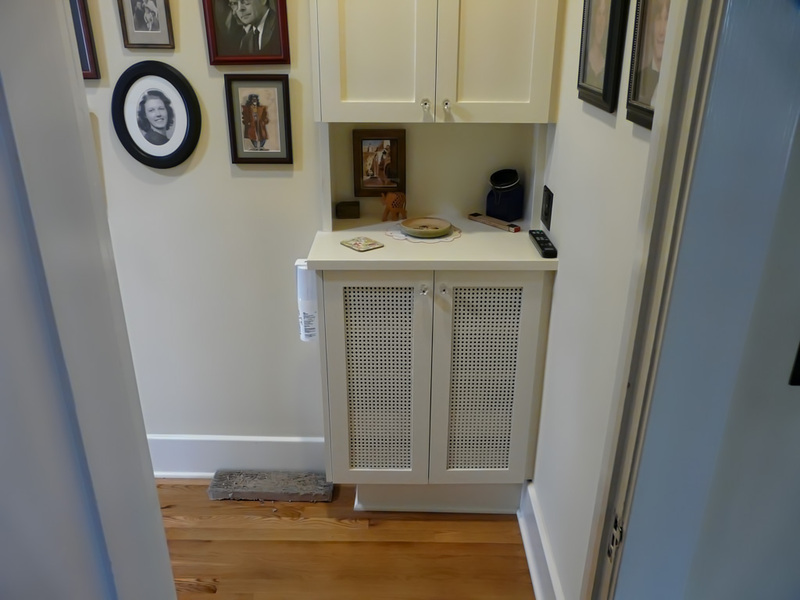 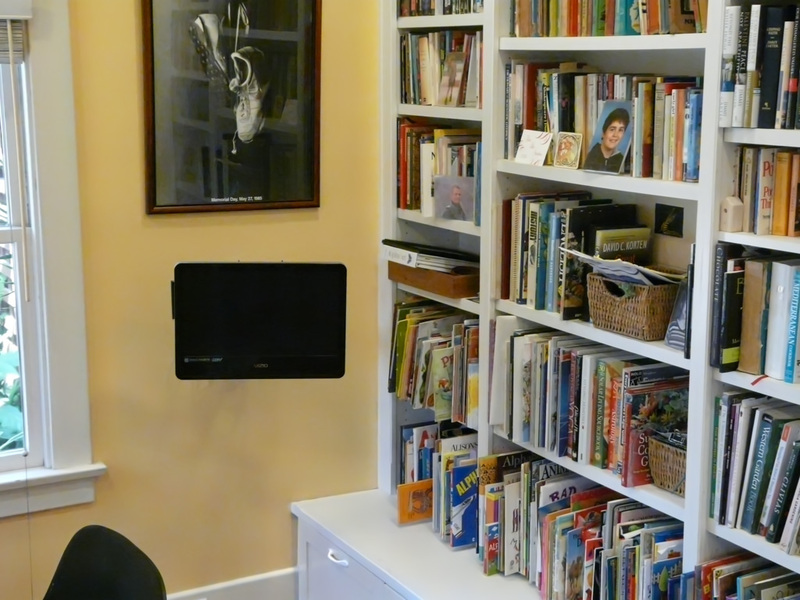 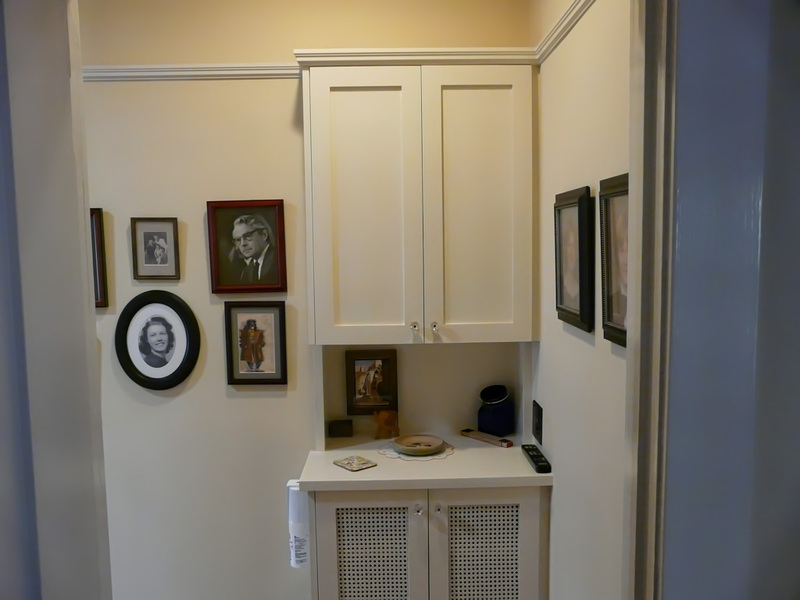 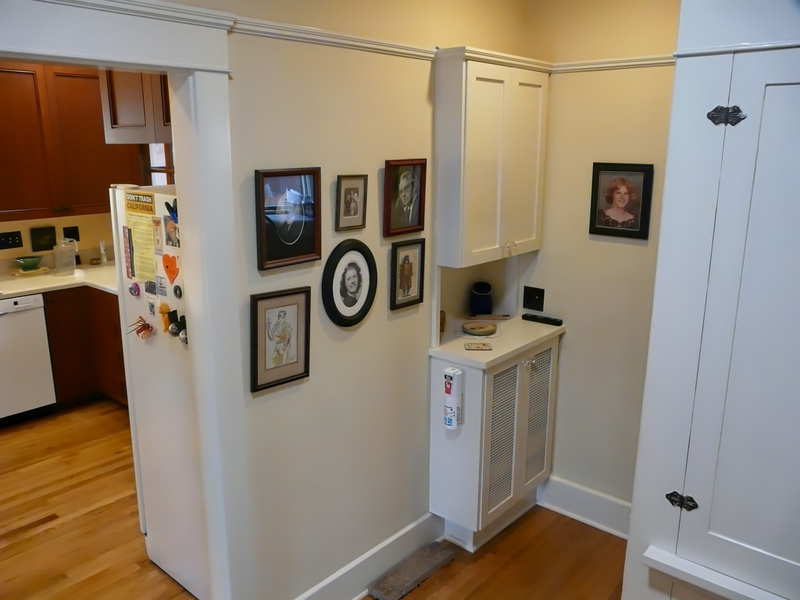 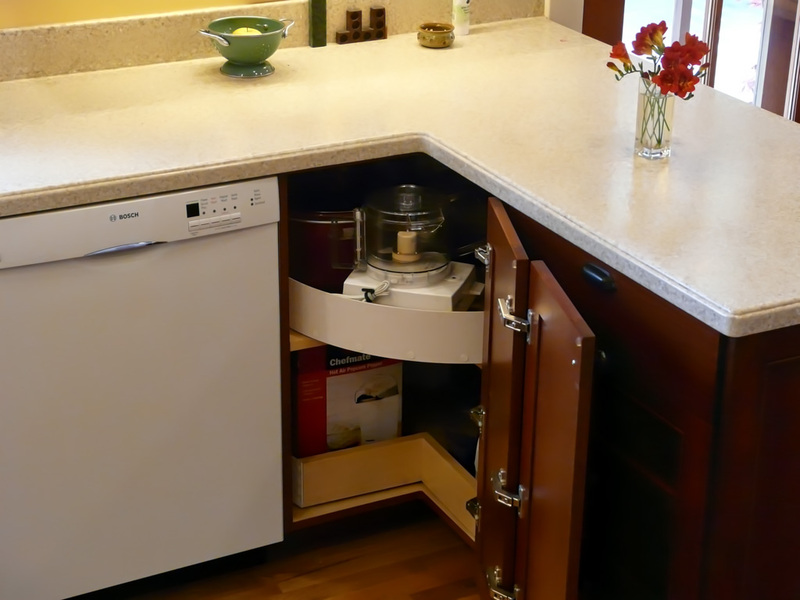 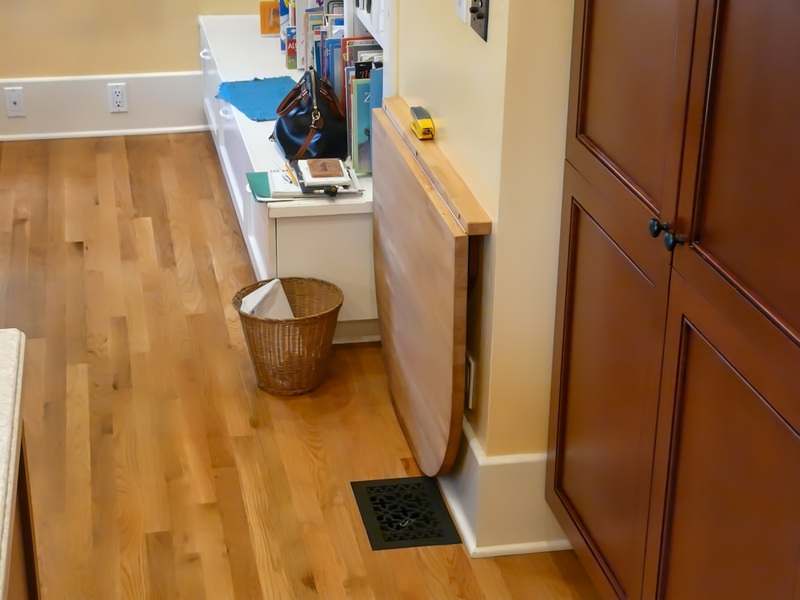 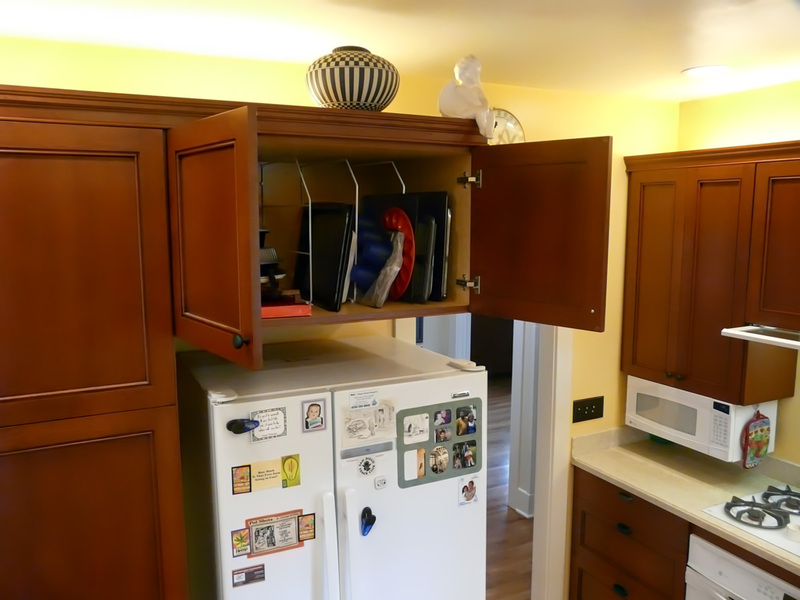 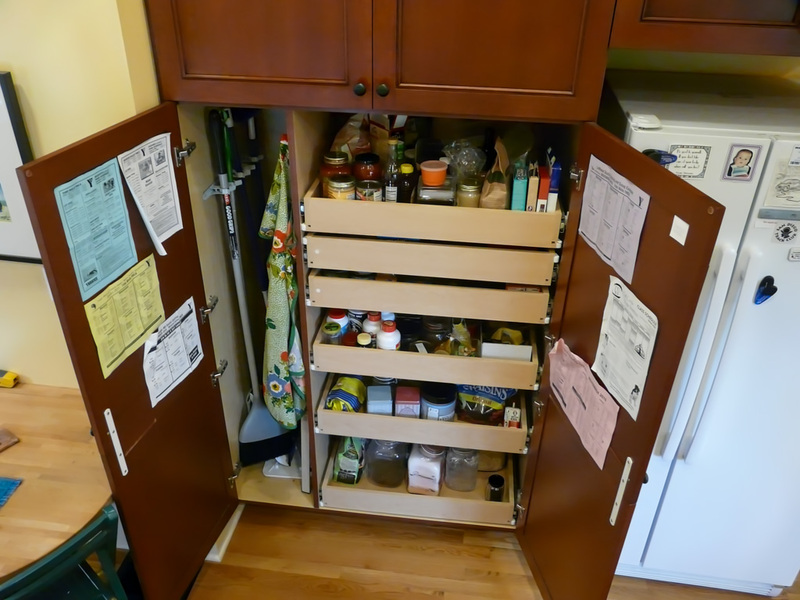 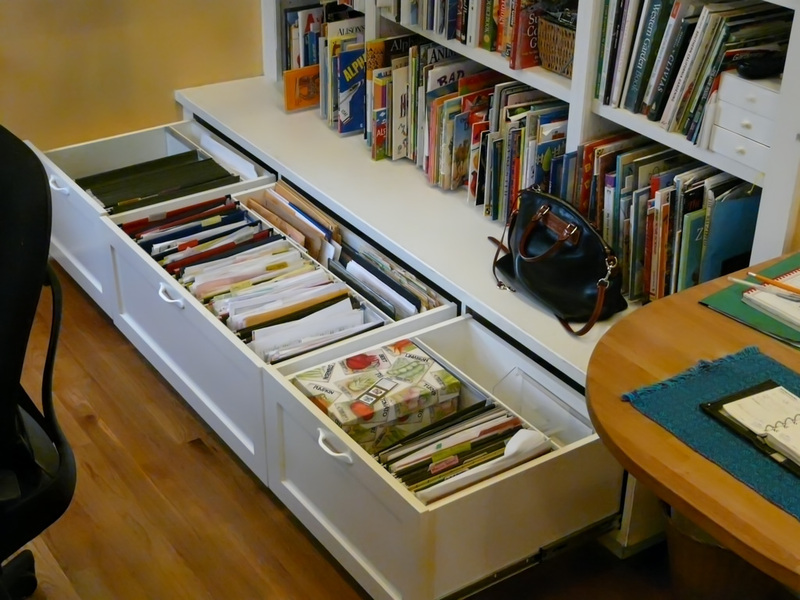 We added plenty of easy access storage features to the kitchen, new file drawers, to the old bookcase cabinets, and a new stereo center that feeds existing built in speakers in all the rooms of the home. 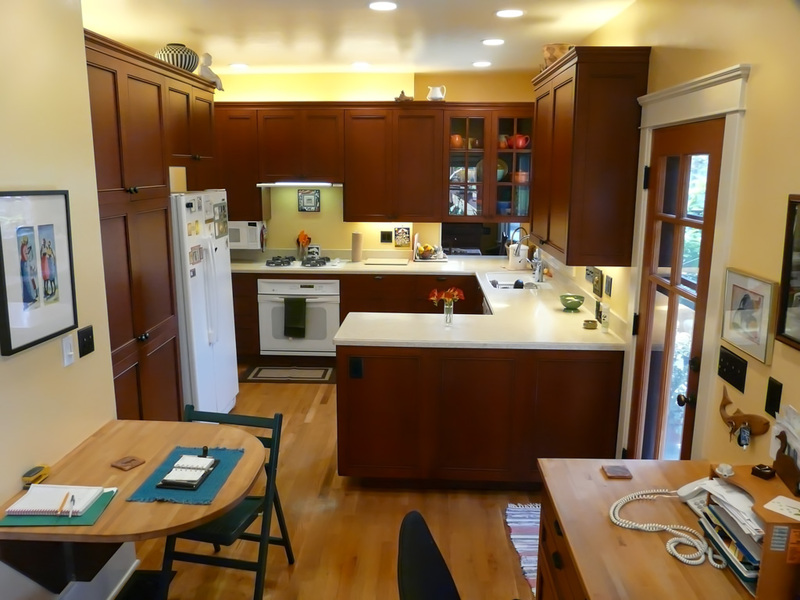 Notice the placement of the recessed down lights over the counter tops as you look around the kitchen: they are not in the typical brain-dead architectural geometric pattern seen in most magazines. 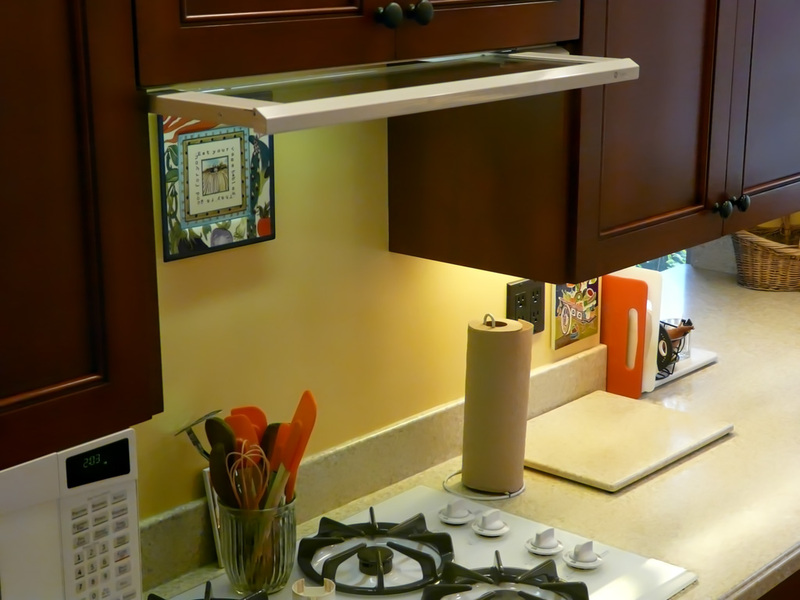 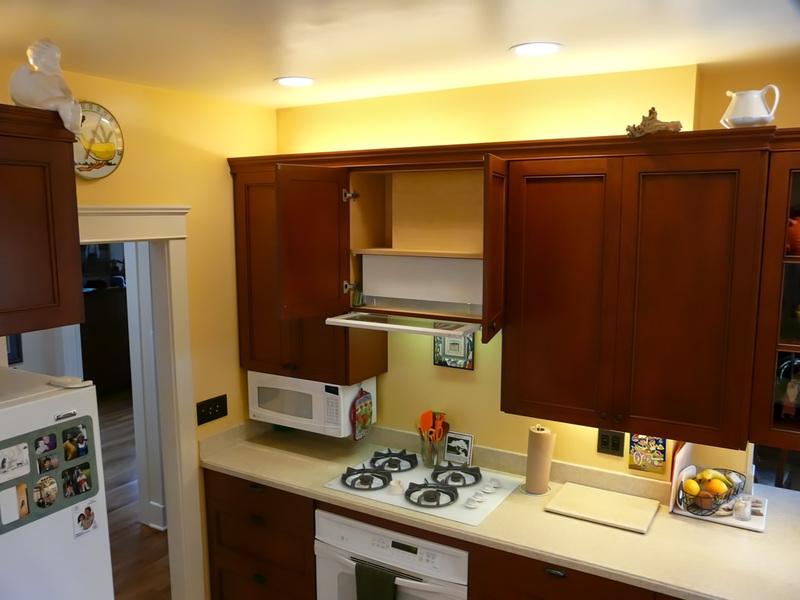 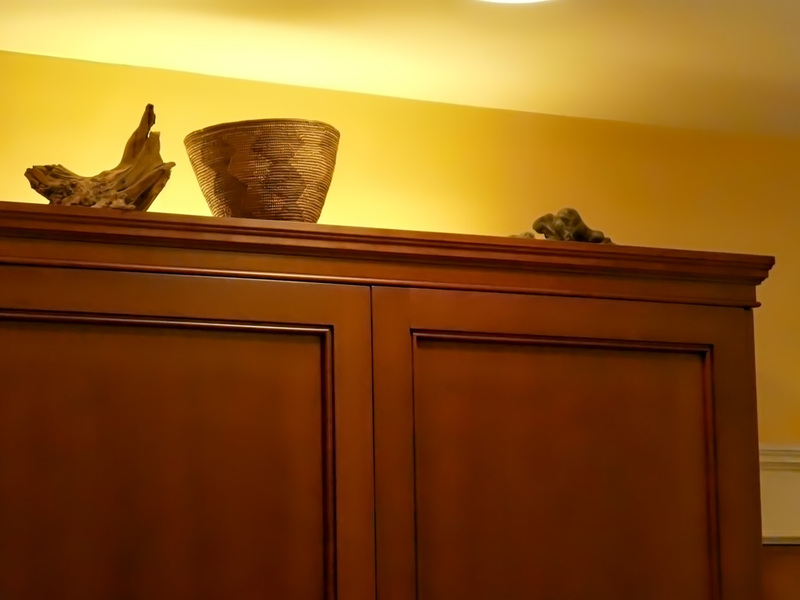 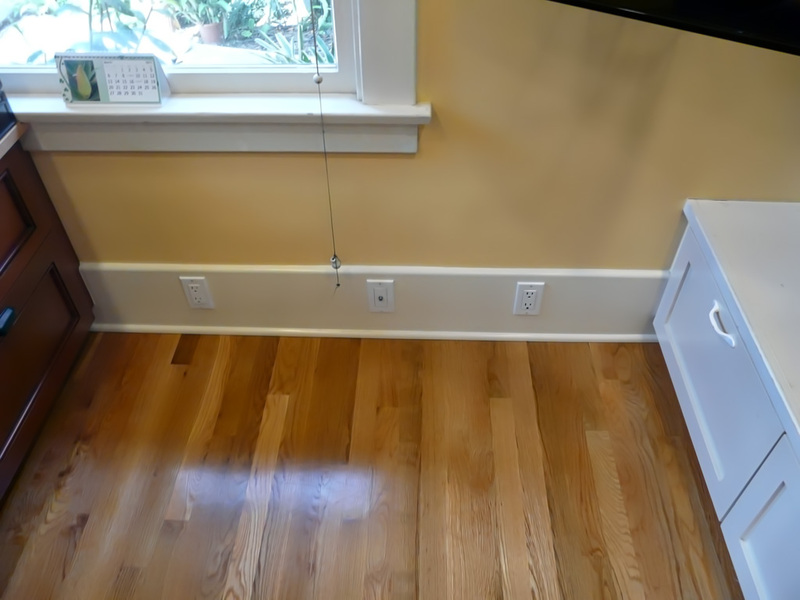 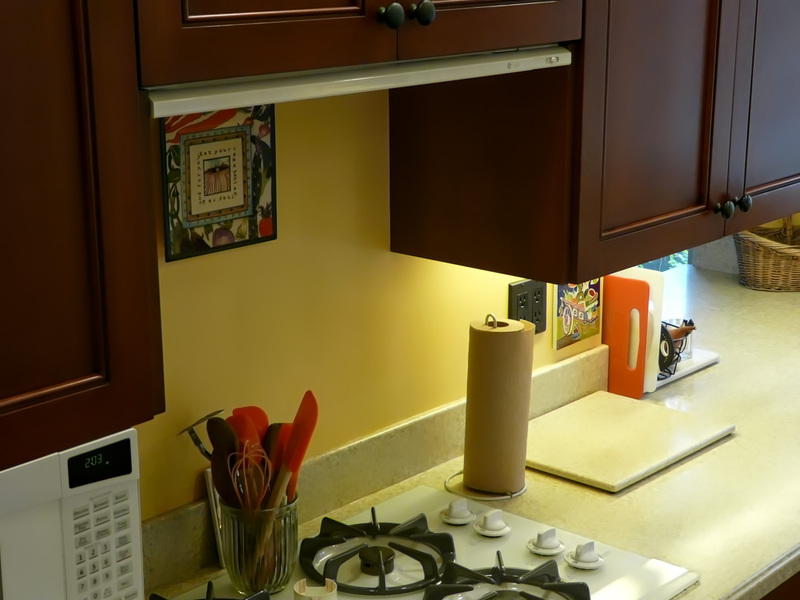 These kitchen lights are placed where they are needed: over work spaces and in front of cabinets so that the cabinets are highlighted and so that you are not working in your own shadow when standing in front of the cabinets like you would if the lights were behind you in a geometric pattern in the ceiling. 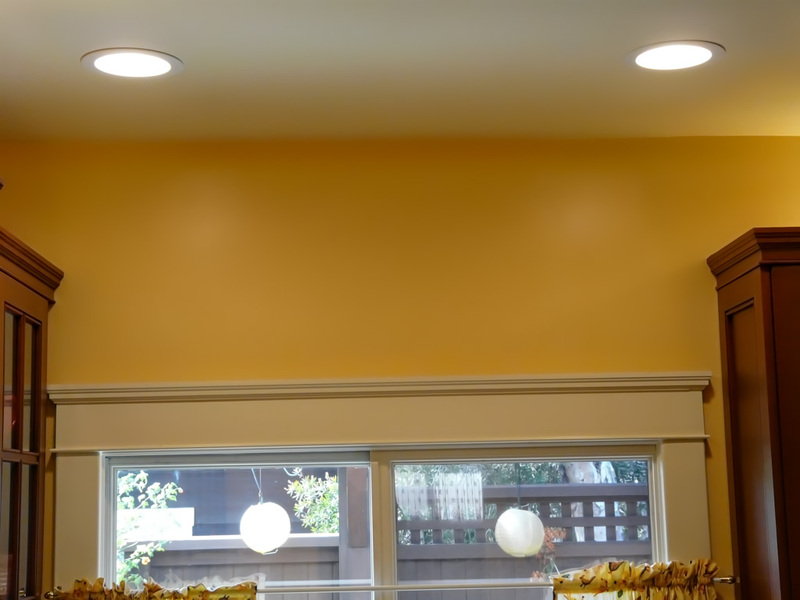 We also supplemented the lighting with under cabinet fluorescent lights. 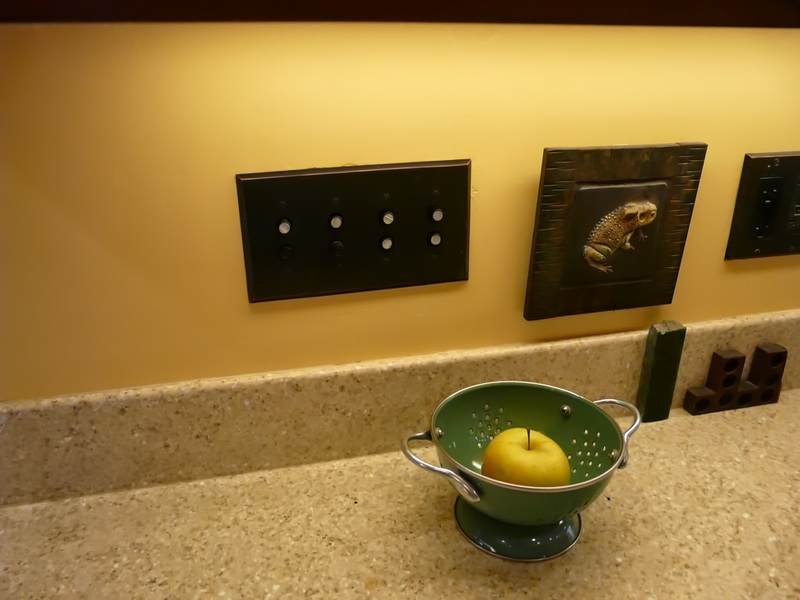 One other element the homeowner insisted in retaining were the old push button light switches and cover plates in oil rubbed bronze finish. 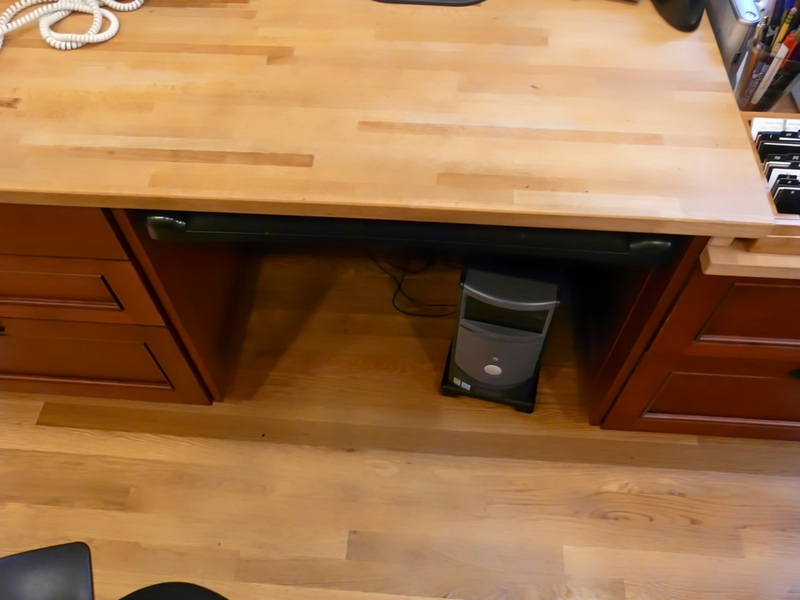 These were not easy to find but they are still available. 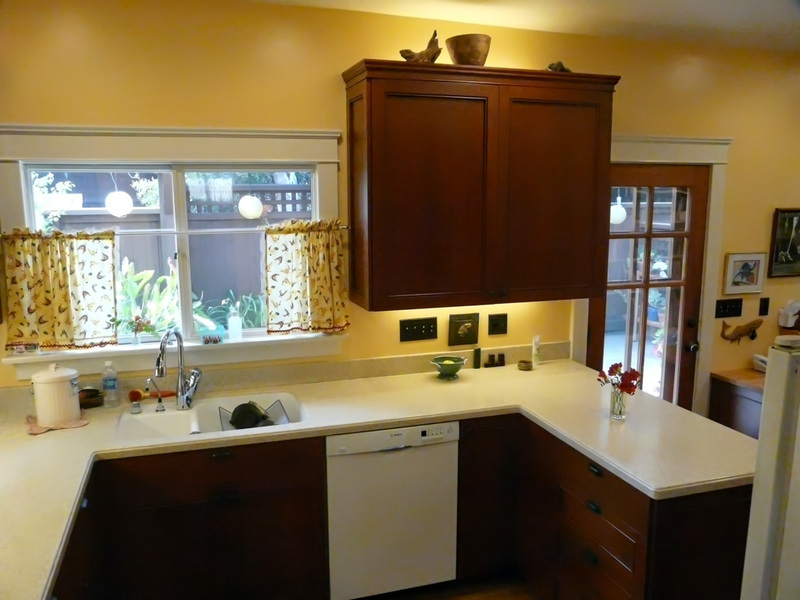 The only thing needed to upgrade this kitchen to today’s standards would be to replace the fluorescent under cabinet lights with LED versions.